I built a unique record player for my son’s 18th birthday,’ says Udo Besser, Managing Director of AVM (Audio Video Manufaktur) GmbH, ‘and that’s what sparked the development of this turntable’. What then kept the fire burning, he told HFN, were the numerous requests for a vinyl spinner from his customers, adding that, ‘also, turntables are my passion’. So Udo set about designing his own deck from scratch, and the AVM Rotation R 5.3 you see here is a clean- sheet design, new to the market. 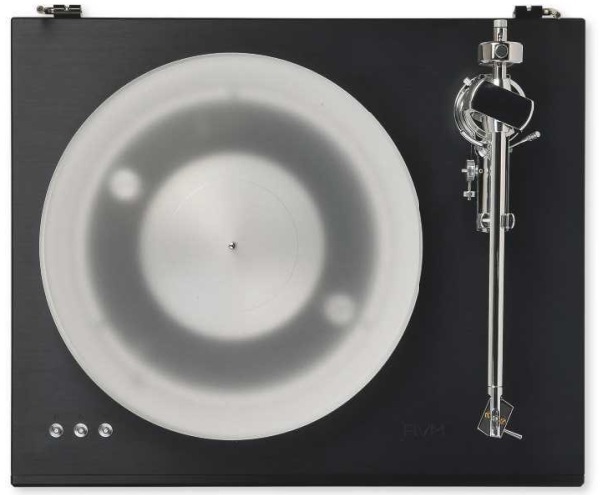 Interesting as it may be, there’s no denying that it’s a little late to the party – given that many electronics manufacturers have rediscovered their love of vinyl over the past decade or so, and launched record players with varying degrees of success. Turntables are relatively straightforward engineering propositions, but designing and manufacturing them doesn’t necessarily fit hand-in-glove with CD player/ DAC/amplifier production. Udo admits it was a challenge, adding that, ‘it was a task to blend the technical aspects into something that was distinctively AVM, and also to create and design our very own tonearms (9in for the smaller R 2.3 deck and 10in for the R 5.3). I felt just relabelling a product was not enough so I wanted to do it my way. Development on the deck started in 2013 with numerous prototypes reflecting its evolution. It was the most expensive R&D project so far in the company’s history’. Although the manufacturing has been outsourced to a specialist European turntable manufacturer, all design has been done completely in-house. Indeed the Rotation R 5.3 sports a novel variant of the belt drive system, the so-called ‘Elipso- Centric Belt Drive’ [see PM’s boxout, p49]. AVM’s tonearm is also noteworthy for being a new design, rather than a rebranded item. In other respects though, it’s a pretty conventional non-suspended subchassis/ heavy plinth belt-drive deck – the like of which we’ve seen many times before. The R 5.3’s largish 470x390mm (wxd) base is made of high-density fibreboard, and proves to be both solid and acoustically inert, if my knuckle knock test is any guide. The top and front are decorated in a layer of brushed aluminium that’s glued to the fibreboard base. ‘The resulting sandwich construction turned out to be a match winner for us,’ says Udo, ‘as it silences the entire table to an extreme degree.’ He adds that the screw- on damping feet were specified along with the massy plinth to keep resonance low. On top of this base sits the large 5kg acrylic platter, resting on a metal inner platter that rotates within the main bearing housing mounted into the chassis. An offboard ‘wall-wart’ PSU connects to the deck via a socket at the rear and, once powered-up, speed is selected by means of three small switches on the front left of the plinth. An electronically- governed DC servo motor is fitted [see PM’s Lab Report, p51 ]. AVM’s partnering 10in tonearm, a medium-to-heavy effective mass design, is made of chromed aluminium alloy – ‘I admit this looks a bit flashy,’ says Udo, ‘but many visitors to my company who saw it liked it and so I decided to put this finish into production. It comes at a price because it is complicated to build’. The arm comes pre-installed so it’s just a case of connecting up your phono leads to the RCAs at the back of the deck [see pic, p51 ]. The lockable counterweight is also used to set the tracking force and in standard guise it’ll accept cartridges from 5 to 8g in weight, or 8 to 16g when the cylindrical insert is added. There’s a range of other adjustments, including azimuth, VTA and bias – the latter via a tiny pulley and weight arrangement – while the large headshell ensures a firm connection with almost any choice of cartridge. Our R 5.3 was supplied in its ‘Aluminium Black’ finish, but there’s also a neutral ‘Aluminium Silver’ version, and the optional Cellini Chrome Silver finish should you wish to dazzle your friends. The deck’s built-in illumination ring is similarly dazzling, this ‘under-platter’ blue LED lighting governed by a rocker switch situated under the plinth, beneath the speed controls. Of this, Udo Besser candidly admits, ‘this is just a gimmick, and you can switch it off’. Supplied largely set up – the belt, counterweight and bias lever needing fitting – all that’s left is a little fine-tuning before the R 5.3 is ready to play. It gets up to speed quickly and there are no groans from the drivetrain, while the arm feels nice to hand-cue. My main criticism of our sample was the poor quality glued rubber drive belt supplied, but AVM says that all versions now on sale have a higher quality continuous type fitted as standard. wears big boots – metaphorically speaking, of course. It plays LP records in an upfront, powerful and unselfconscious way, albeit lacking some of the finesse and artistry demonstrated by price rivals. This makes it rather better suited to some types of music over others, the former including the soul/funk strains of The Dukes’ ‘So Much In Love’ [from Bugatti & Musker; WEA K58479], where it took the bull by the horns and blasted out an expansive, gutsy sound with plenty of detail and a crisp, spacious treble. This deck’s bass is something that really hits you, because it’s a touch on the fulsome side, giving a deep and strong feel to the bass guitar work. 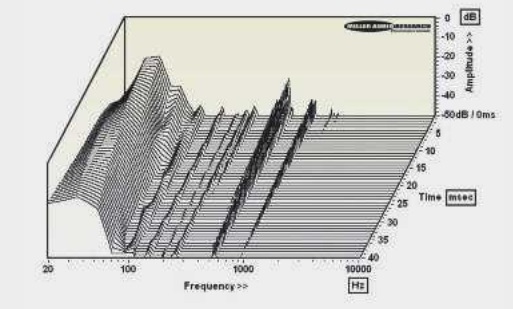 Indeed, at high volumes the back of your chest can become as important as your ears in the whole listening sensation. However, I’d suggest that this determined bass is not entirely accurate, because there’s also a slight slurring here – an overhang that shouldn’t really persist. Careful siting on a light, rigid hi-fi rack can help slightly, but never really alleviates it. It’s arguable that most belt-drive designs suffer from this to an extent – you only need to cue up the rock-solid direct-drive Technics SL-1200GR [HFN Nov ’17] to remind yourself of this – but the Rotation R 5.3 is arguably more guilty than most. This isn’t to say it’s an unpleasant sensation, just not an entirely accurate one. In his online video presentation [www.facebook.com/avmaudio/videos/325522361594326] Udo Besser, AVM’s MD and chief designer, provides a tour of the R 5.3 and introduces the ‘Elipso-Centric Belt Drive’ with its drive and guide pulleys mounted 180° across the alloy sub-platter [see inset picture]. Soundstaging, by contrast, was very impressive indeed – many high- end turntables do well here and this was no exception. Kate Bush’s ‘Running Up That Hill’ [Hounds Of Love; EMI KAB1] was a joy. Properly done, this track should have an epic, windswept feel as if you’re standing on top of a mountain. The R 5.3 duly obliged, separating out the many strands of the mix with aplomb and putting them all in clear perspective relative to both the listener and each other. The repetitive beat of the sampled drum track underpinned this vast soundscape, with Kate’s voice appearing imperiously from on high, hovering across the middle of the acoustic with great confidence. Again, I’ve possibly heard greater image precision from rival turntables – the Michell Orbe/TecnoArm combo a particular favourite of mine when it comes to reproducing great stage width and depth – yet the R 5.3 is up there with the best of them. In terms of ‘following the rhythm’, however, the Rotation R 5.3 is good but not quite top-tier material. It has a certain sledgehammer quality to the way it plays music – which is actually rather enjoyable with repetitive, metronomic material such as Uncle Bob’s ‘Burly House’ [Trance (Various Artists); Rumour Records RAID 508]. This classic early ’90s slice of trance was great fun, the turntable chugging along to deliver large amounts of bass and crisp percussion from the drum machine, with its hi-hats, rim shots and hand claps. Yet with richer-sounding rock music, things could sound just a little routine. For example, REM’s ‘Texarkana’ [Out Of Time; Warner Bros Records WX 404] is a great ’80s indie track driven by jangling Rickenbacker guitars, and though this turntable powered it along forcefully enough, it didn’t quite catch the subtle syncopations between the instrumentalists. A little too methodical, it didn’t draw all the emotion out from the song. By way of explanation, I’m tempted to suggest that this turntable isn’t quite as good at revealing musical microdynamics as some rivals – these subtle dynamic accents distancing a magical portrayal from the merely very good. Tonally, aside from that slightly thick and over-warm bass, the R 5.3 is on firmer ground, so you can cue up different albums from different eras and clearly hear the contrast. For example, the lush, sweet and silky ‘Cafe Regios’ [from Isaac Hayes’ Shaft: Original Soundtrack; Enterprise ENS-2-5002] clearly sounds very different to the super dry post-punk thrash of The Undertones’ ‘You’ve Cot My Number’ [Hypnotised; Sire SIR 4024]. Evidently the R 5.3 has been aimed at broad cross-section of buyers who want to enjoy playing records with relatively little fuss. But purist vinylistas who demand forensic accuracy from every LP they play will likely look elsewhere. I discussed AVM’s ‘Elipso-Centric Belt Drive’ in our boxout [p49] but while this demonstrates potential it cannot offset the low-rate drift measured from the R 5.3’s DC motor or correct the slight -0.3% error in absolute speed. 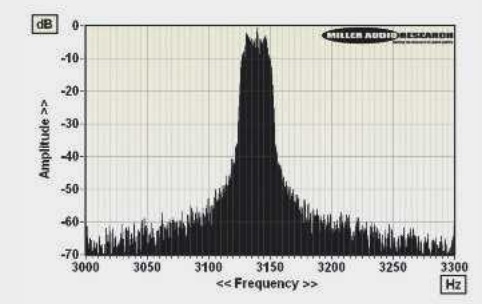 The drift, illustrated by the lack of sharpness in the 3150Hz test tone [see Graph 1], amounts to a peak-weighted W&F of 0.25%, which is a little disappointing by contemporary standards, as is the belt which, as supplied, is glued rather than continuous and responsible for a faint ‘tick’ as it passes around the pulleys. Nevertheless, start-up time is good at a few seconds. Furthermore, its through-groove noise is impressively low at -70.1 dB (DIN-B wtd, re. 1 kHz/5cm/ sec), the test LP’s impedance match with the 5kg acrylic platter successfully attenuating the through-spindle (bearing) rumble figure which is slightly poorer at -67.9dB.